Scientists have isolatedthe most powerfulbroadly neutralizing antibodies (bNAbs) against HIV so far – a major step towards finding an effective vaccine against the deadly virus. Capable of fighting a broad spectrum of variants of HIV – the virus that causes AIDS – some of the 17 antibodies discovered jointly by The International AIDS Vaccine Initiative (IAVI) and The Scripps ResearchInstituteblockedHIVinfection of cells as much as 10 to 100 times as potently as the previously discoveredbNAbs. An antibody is an infectionfighting protein produced by our immune system when it detects harmful substances like viruses and bacteria. These HIV neutralizing antibodies are produced naturally by a minority infected with HIV, but who show no symptoms. The new antibodies that target the CD4 binding site on HIV – the sitewherethe virusengagesthe T cells to initiate its infection – was isolated from blood serum samples acrosstheworld. Dr Rajat Goyal, IAVI’s India head said, "This cocktail of bNAbs will help us design the mosteffectiveimmunogens,the active ingredients of vaccines, which will then help us find the elusive HIV vaccine. Only a minority,who areHIV-positive,begin to produce bNAbs after several years of infection. 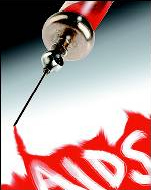 Animal studies suggest that such antibodies could block HIV infection if they were elicited by a preventive vaccine." The 17 new bNAbs were isolated from four HIV-positive individuals that are mostly of African descent.Earlier in 2009, this same research team had found two potent bNAbs, PG9 andPG16. Dennis Burton, director of theIAVINeutralizing Antibody Center, said, "Most antiviral vaccinesdependon stimulating the antibody response to work effectively. Because of HIV’s remarkable variability, an effective HIV vaccine will probably have to elicit broadly neutralizing antibodies. This is why we expect that these new antibodies will prove to be valuable assets in the field of AIDS vaccine research." Experts say a vaccine againstHIVis a mustwith7,000 new HIV infections occurring daily and 9 million HIV-infected individuals unable to access life-saving antiretroviral medication. The new bNAbs are encouraging. Many of them bind to unknown molecular structureson thesurfaceof HIV.This means that they could significantly broaden the target options researchers have in designing vaccines to elicit similar antibodies. Since HIV was first identified in 1981, 40 millions have been infected with the virus. Annually, an estimated four million newinfectionsoccur,of which 90% are in developing countries. Over the last 25 years, AIDS has claimed more than 25 million lives.